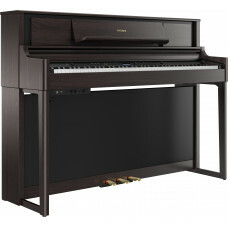 If you’ve on a budget, but still have high expectations of piano tone, the LX-705 is designed to satisfy. This piano stands apart even at the most basic level – the way the sound is created. 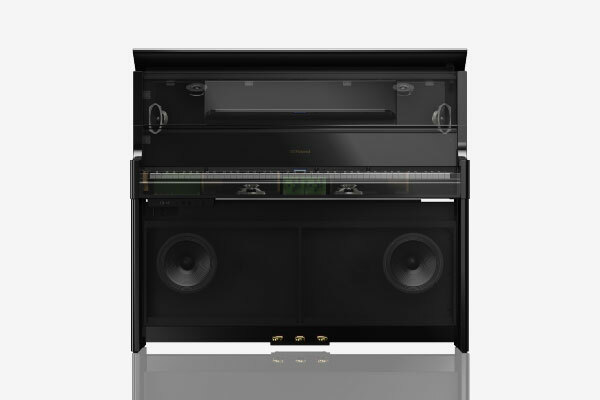 There’s the choice of two world-class pianos in one, each with remarkable tonal character that you won’t find anywhere else, and a powerful speaker system that’ll give you goosebumps. If you prefer the finer things when it comes to playing music, the LX-705 is a sound investment. Tone is a priority for any serious pianist. The rich sound of a grand piano is created by a multitude of physical interactions; keys are pressed, hammers strike, strings resonate, and sound emanates. These and many other elements all contribute to the final sound that reaches the player. Roland’s entirely new PureAcoustic Piano Modeling uses advanced technology to reproduce the interactions within each of these stages, resulting in a beautifully rich sound that, until now, could only come from a grand piano. 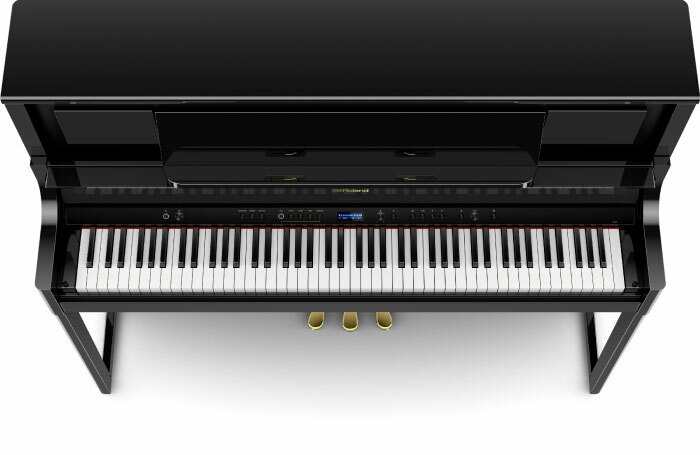 Most digital pianos use ‘sampling’ technology, which records the individual notes from an acoustic piano and combines them to deliver the final sound. This approach results in a limited range of expression, similar to when animation is composed by still images. Roland takes a different approach, producing the sound using advanced digital modeling technology that recreates the process of piano-tone-generation in real-time. It’s so accurate that your expression and touch is captured as you perform, and reflected onto the tone, resulting in a beautifully rich sound that compels you to play. Even experienced pianists need fresh inspiration. The LX-705 includes two completely different piano models; a classic European grand with a rich, deep tonal character, and an American grand that emphasizes clarity and brightness. This approach goes far beyond the typical sound variations found on conventional digital pianos. Think of it as owning two world-class pianos, representing two distinct-but-complementary sides of the piano’s tonal spectrum. You can even customize the sound so it’s exactly how you like it. Each LX700 model includes an Acoustic Projection System, reproducing the rich, room-filling sound of a grand piano in a great venue – without needing the floorspace. The LX-705 houses a two-way, four-speaker system, driven by a powerful amplifier, with each speaker fulfilling a specific role in delivering superior piano tone. The powerful cabinet speakers produce the all-enveloping main sound, while the top-mounted spatial speakers reproduce the resonance of the piano’s frame, projecting through the front C-shape wide aperture. Finally, the nearfield speakers project the sounds you’re most likely to notice, including dramatic, dynamic overtones and even the noise of the hammers hitting the strings through the keyboard section. Four-speaker Acoustic Projection System, comprising four independent speakers, each optimized to recreate specific elements of a piano’s sound (for example, cabinet and body resonance, or the sound of the hammers striking the strings). Each keyboard in the LX700 range feels natural and expressive to play, thanks to a number of innovations. 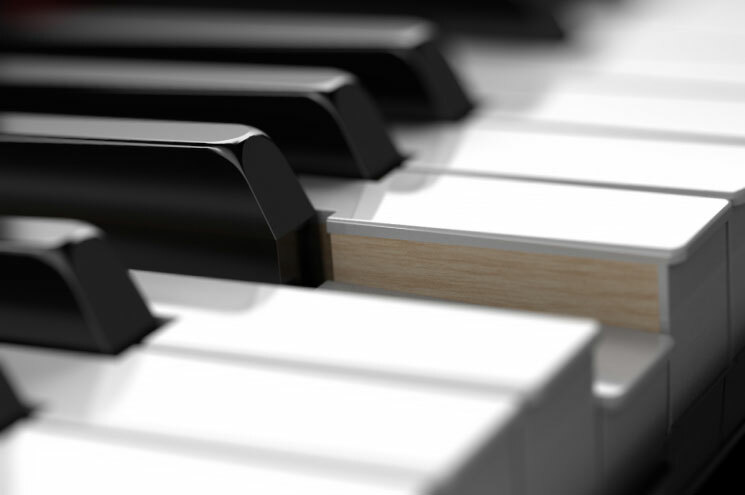 The white keys combine beautiful wooden sides with a durable inner frame, ensuring years of reliable service without ongoing maintenance. The pivot point on the black keys is 2cm further back than on the white keys, so they’re easier to press which avoids fatigue when you’ve been performing for a while. And both the black and white keys are longer than you’d normally find on a digital piano, with the extra length reducing the weight difference between the key’s edge and its end. Plus, all the keys include a stabilizing pin to ensure smooth and precise vertical travel, avoiding the sideways key movement and noise of playing glissandos on some pianos. The result is a series of keyboards with the optimum balance of resistance, momentum and return movement, capable of anything – and everything – you ask of them. The keys replicate the look and feel of real ebony and ivory, and their textured, moisture-absorbing properties mean your fingers won’t slide off. Advanced techniques aren’t limited to the keyboard. Roland’s Responsive Damper mechanism recreates the damper pedal response of a grand piano. Sit down at the bench, close your eyes, and imagine playing a top-tier grand piano in a renowned concert hall. Transformed by the acoustic properties of the hall, the sound becomes even more dramatic and powerful. To recreate this experience at home, the LX700 series not only reproduces the rich, powerful sound of a grand piano, but also the space in which it’s played. Discover how it sounds to play in larger spaces, including concert halls, cathedrals and studios, adding an extra dimension to an already wonderful instrument. 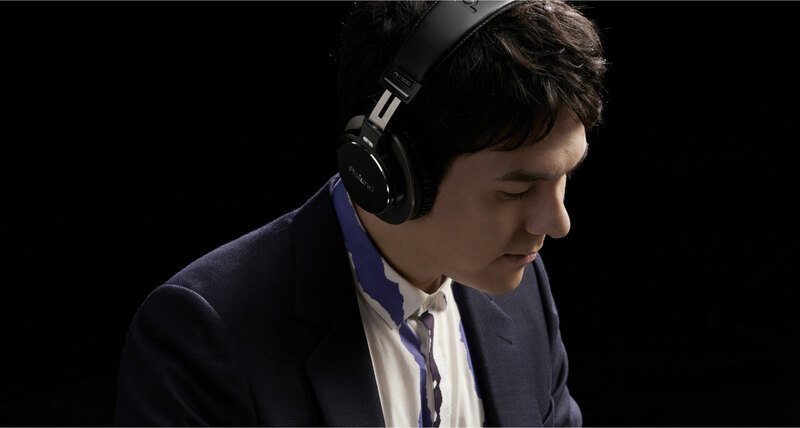 A key advantage of a digital piano is using headphones, to avoid disturbing others. But the LX700 series takes it a step further, using Headphone Acoustic Projection technology to optimize the sound sent to the headphones. As you play, you’re enveloped in rich, warm sound that seems to emanate from the piano itself. You’ll enjoy all the benefits of the PureAcoustic Ambience feature on the headphones, too – just close your eyes and you could be playing a midnight concerto in a concert hall, from the comfort of your own home. When a piano sounds this good, it should look good too. From the tall, impressive cabinet, to the elegant front legs and sophisticated curves, every piano in the LX700 series draws you in and compels you to start playing. Across all three models, the finish has been carefully selected and meticulously manufactured, so you can choose a piano that truly looks at home in your living room. The LX700 series provides an alternative to conventional book-learning with an array of educational features. Playing alongside the onboard songs prepares you for joining a band or orchestra, while Twin Piano mode lets a learner and teacher play side-by-side in the same key range. The built-in metronome develops accurate timing, while the onboard recorder lets you capture what you’ve just played, then listen back to evaluate your progress. Meanwhile, the unique Do Re Mi Lesson found in the onboard songs lets you learn music basics, by singing solfege along with the songs or practicing score-reading.